This course focuses on scientific measurement, experimental method, introductory chemistry and biochemistry, cells and cell division, genetics and DNA, evolution and animal anatomy and physiology. Main topics in the lab include microscope skills, biochemical molecule model building, dissection as discovery, experimental design and introduction to DNA and molecular genetics. This course enables students to develop a better understanding of the natural world and helps them to build skills and habits that will be a foundation for more thoughtful work in following courses. Full year course – 1 credit. This course surveys a number of topics in biology, including development, cell biology, anatomy and physiology, biochemistry, molecular biology, neuroscience and metabolism, with a considerable focus on neuroscience, specifically the cellular and molecular workings of the nervous system. We cover fewer topics than a general survey course to allow time for examination of these concepts in greater detail, particularly within the context of issues relevant to today’s society. We foster enthusiasm for science by demonstrating how knowledge of biology can influence everyday life. The goal of the course is to produce a scientifically literate student who can recognize good scientific method from bad and talk intelligently about topics such as stem cells, genome sequencing and neurodegenerative disease. This course is designed to prepare students for the introductory science courses they will see in college. Prerequisites: Biology, Chemistry. Full year course – 1 credit. This is an introduction to science as a quantitative, laboratory-oriented process. Emphasis in the laboratory includes the use of the metric system, safe handling of chemicals and equipment, continued instruction in the proper method of writing a laboratory report and the exercise of logic in performing an experiment. In-class demonstrations and labs are used to amplify the concepts of the course. Topics covered include chemical mathematics, matter, chemical formulae and equations, the mole concept, gases, atomic theory, the periodic table, chemical bonding, solids, liquids, solutions, equilibrium, acids and bases, oxidation reduction and electrochemistry. Prerequisites: Algebra, Geometry. Full year course – 1 credit. This course is for students who have a strong interest in science and want the challenge of taking a general chemistry course at the college level. Because the best way to learn chemistry is by doing it, strong emphasis is placed on laboratory work and problem-solving skills. Topics that were covered in introductory chemistry are investigated in greater depth. Prerequisites: Chemistry, Advanced Algebra. Full year course – 1 credit. This course is designed to undertake an in-depth study of critical environmental issues, including population, resources and pollution. Outdoor lab work includes mapping and study of the campus forest and other regional ecosystems. Doane Stuart’s 22,000 square foot green roof provides additional inspiration; students explore the science, history, theory, politics, design and implementation of “green” initiatives at home and abroad, and they make and track observations of weather patterns and plant and animal life on the green roof and in the surrounding environment. Environmental problems are broad in scope; this course integrates work in ecology, geology, atmospheric science, biology, chemistry, law, economics and ethics. Prerequisite: Biology. Full year course – 1 credit. How has film shaped past and present interactions between humans and the environment across different cultures and landscapes? Film has the power to incite emotion and action in its viewers, and films that explore environmental themes are no different. Over the past decade we’ve seen the success of Avatar and March of the Penguins; we’ve seen the impact of films like An Inconvenient Truth and Blackfish, both films that have created public outcry in their respective fields. These are just some examples of how films can inform and engage the public in critical environmental issues that affect human and animal lives across the globe. And yet, what part do these films play in our overall understanding and action when it comes to environmental issues? Do films make a difference? In this course, we watch, analyze, and explore the history and theory of films that might be labeled environmental cinema. This course provides an introduction to environmental studies through the lens of food science and sustainable agriculture. We study how soil and microorganisms impact food, how the growing branch of food microbiology affects our health, how our current food system works both within the country and within the world and how we can plan an agricultural system for a growing population. We look at ideal farm systems, along with our local farms and dairies in the Hudson Valley. principles, kinematics, forces, momentum and energy – through reading, discussion, labs and an inquiry-based approach to solving problems. Full year course – 1 credit. 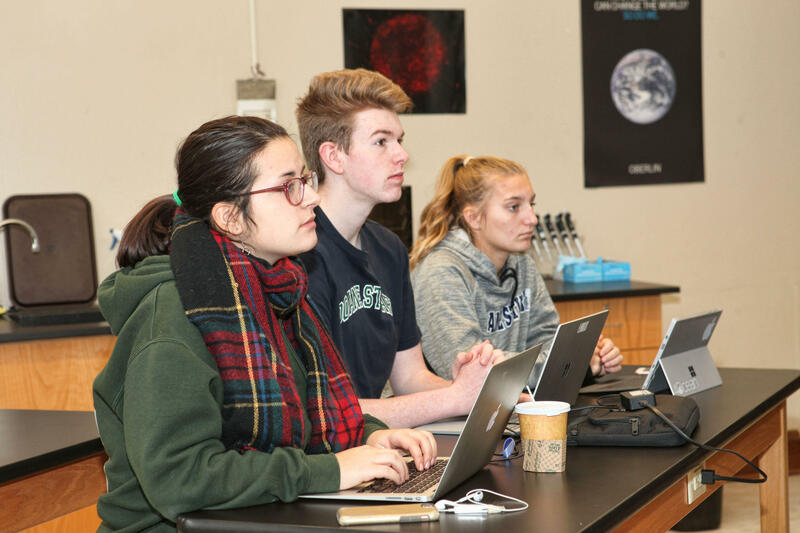 Physics is the capstone to a series of courses that expose students to the mathematical, logical, and creative aspects of science. The skills of writing an expert laboratory report, giving college-level oral presentations, understanding experimental design and interpreting data are stressed. Students are trained to become problem-solvers with a series of largely open-ended lab questions. A goal of the course is to increase the students’ appreciation of the world through an understanding of its physical principles. The laptop computer is an essential tool in the collection and analysis of motion data. Signal generators and lasers are used to study wave behavior. Prerequisite: Advanced Algebra (proficiency in trigonometry is essential) and Precalculus (may be taken concurrently). Full year course – 1 credit. This course looks at physics concepts on the subatomic level, as well as in two and three dimensions. The course focuses on the interconnected nature of math and science by working through the physics concepts using calculus principles. We investigate why and how things behave the way they do. Topics covered include rotational motion, the standard model of the atom and other modern physics principles. Prerequisites: Physics, Precalculus, Calculus (can be taken concurrently). Full year course – 1 credit. This course is an introduction to psychology. It provides a foundation for the ways in which psychology approaches basic questions about how and why we behave the way we do, using a contemporary definition of psychology, which is the science of behavior and mind. We consider how our understanding of the biology of the brain (neuroscience) has an impact on psychology. This comes under the field of cognitive psychology (sometimes called psychobiology), but we focus on a subfield within cognitive psychology that attempts to identify the biological correlates (molecular mechanisms) of cognition and how these relate to abnormal behavior being labeled as “brain disease.” The implications are discussed from a treatment perspective, as well as a legal/societal perspective. Semester Course – ½ credit.